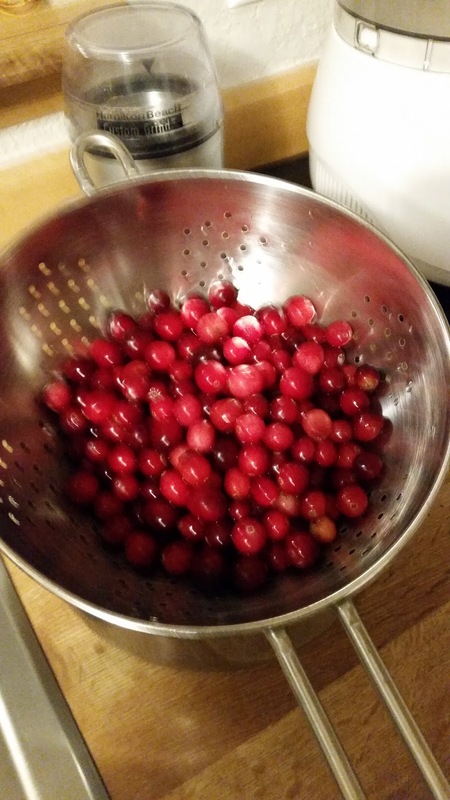 I have always loved cranberries, in the same way as I love rhubarb. That tangy sour essence is made alive and magical by the addition of a bit of sugar or honey. Not a lot mind you, too sweet mixed with sour is not delicious, it is heavy and forced. Living here on the peninsula I have become more intrigued with cranberries, from the harvest which is almost a dance on water, to the enjoyment of eating them. They are beautiful, unique and delicious. And a fresh berry will bounce, with a tiny rattle heard inside from the seeds. 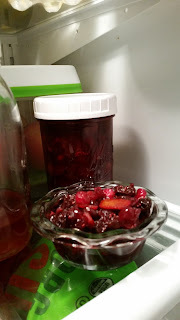 I was thinking about this sauce and thought I had a bag of frozen berries in the freezer in which to make it with. However, the freezer proved me wrong! 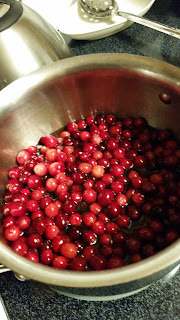 I had already used them in a delicious blackberry cranberry grapefruit jam. And while I love opening those jars to enjoy, I was now out of cranberries. I posted a little complaint on my Facebook page and a friend here on the peninsula reached out with a 5-pound bag I could have. And while I could simply have them, if I had a loaf of that delicious bread around, she would enjoy one in exchange. I immediately sent a reply, "are you home? we are headed that way." So we did. Bring the water, sugar, salt, dried cherries and orange rind to a boil, reduce heat, simmer 10 minutes. Turn up the heat to boiling, add cranberries and Gin. 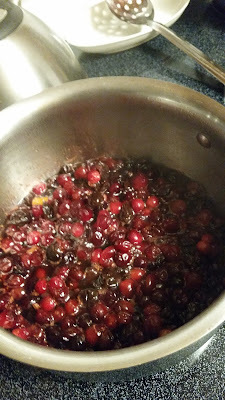 Let mixture boil over medium-high heat 5 minutes, reduce heat, cover and simmer for 5-8 minutes or until cranberries "pop". 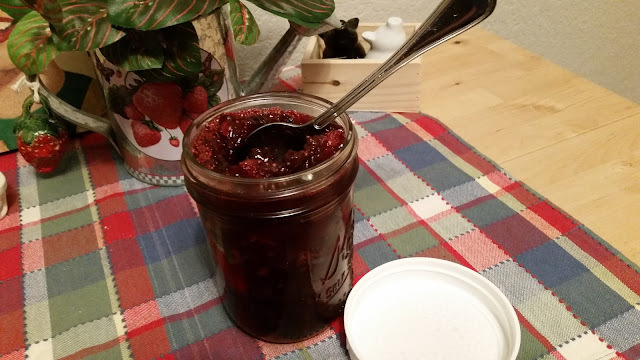 While my serving container is not pretty, we have a three-hour drive for our Thanksgiving meal, and the white-capped mason jar seemed the best choice, the small bowl, however, will be breakfast with buttered toast!